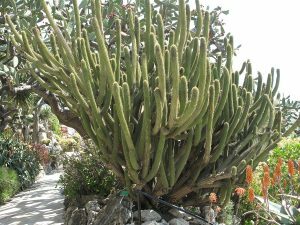 ≪Weberbauer’s cereus≫, genus honouring August Weberbauer (1871-1948), German botanist who was director of the botanical and zoological gardens of Lima (see picture above, public domain). A genus of shrubby, columnar to treelike plants, branching from or near the base, sometimes with a well defined trunk. Branches erect or curved, sometimes intermingled, ribs variable in number (8-25), areoles close-set, large, woolly, whitish to grey or yellowish. Radial spines numerous (20-60), setose to aciculate; central spines, when present, sturdy. Flowers nocturnal, self-sterile, remaining open in the morning, appearing near the apex, tubular to funnel-shaped, roughly zygomorphic, with a floral tube more or less S-shaped, whitish, brownish or reddish, with pericarpel covered with scales and with hairs, pollinated by bats (Glossophaga soricina, Platalina genovensium) or by hummingbirds (Patagona gigas, Rhodopis vesper), also bees. In Peru, the flowering of Weberbauerocereus weberbaueri is nocturnal (but still open in the morning), and the pollination is mainly done by bats, also by hummingbirds in conditions of extreme aridity (Sahley 1996), which is a clear example of a pollination syndrome both diurnal and nocturnal in South America. Fruits rather small, yellow orange-coloured to greenish or reddish, somewhat hairy, with a white pulp, floral remains persistent. Seeds rather small, numerous, black, shiny. 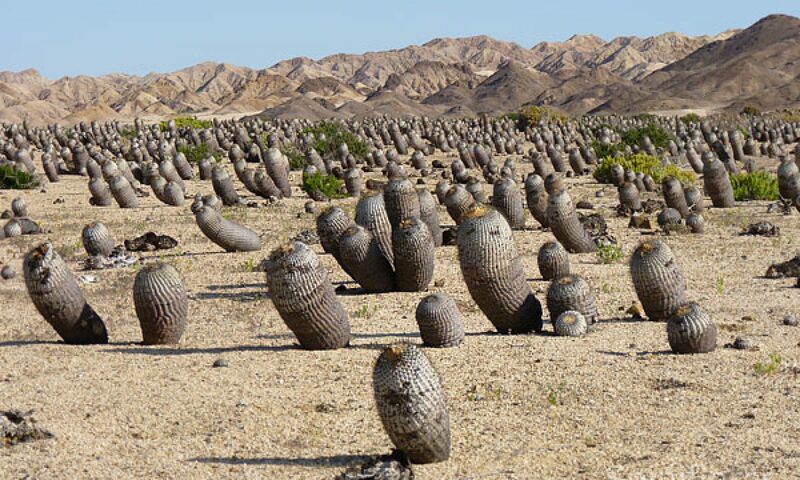 Seed dispersal ensured by bats (chiropterochory) to a small extent and inefficient because of only the few colonies of bats that exist. The genus Weberbauerocereus grows usually in high valleys, on north facing slopes often covered with humid fogs, on rocky reliefs, among a shrubby vegetation or among rocks, from 540 m up to 3500 m in altitude, sometimes together with other columnar cacti (Armatocereus, Browningia). The only Bolivian species, recently described (2010) W. madidiensis, is restricted to the tropical dry forests in the Yungas sub-Andean region. Bolivia (La Paz), Peru (Ancash, Arequipa, Cajamarca, Cuzco, Huancavelica, lea, La Libertad, Lima, Moquegua).